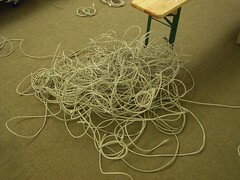 Right now, I am in front of a bunch of hundreds of metres of messy ethernet cables. 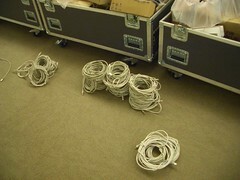 “Unwire them and then put them nicely into groups of 3, 5, 7 and 10 metres. Later you can assemble wall enclosures” my boss told me. I am the cable guy. I am a hand for constructing the Bread&Butter Barcelona which will take place from 18th to 20th of january. And I am glad to have a job. I guess I will be posting now and then some pictures from the construction site. It’s great, already many people working to put together one of the styliest fashion events in Europe. Stylewalker will be part of it.